When a man reaches the top notch of his profession, and especially of a profession where the lure is so tempting and the prizes are so few, you begin to wonder whether it is luck or brains that counts. Gillette has certainly had luck, but he has had it of both blends. He was lucky in the first place not to be an infantile prodigy, although he had his own theatre when he was ten years old. When the Army of the Potomac was closing in on Richmond in 1864, and the noble and embittered fighters of North and South were laying in the bloody background for the best war plays that have been written, the des­tined maker of these plays w a s disposing paper puppets on a miniature stage in the garret of his father's house at Hartford, Connecti­cut. Can't you see him there, thin and over-tall for his age, jumping and skip­ping from side to side of the tiny stage in order to manipu­late the invisible black thread that is the artery of life to his characters? The wide-eyed, rosy­cheeked audience of five or ten playmates, induced to at tend only because it is a rainy day, sits won­deringly before the incomprehensible achievements of the master magician. And when a mali­cious puppet balks at the tug of the thread, -the audience grows quite as ner­vous as the stage manager. Finally a desperate twitch snaps the artery, and the paper mum­mers fall in a jum­ble. The audience with infinite relief bursts into laughter. That breaks up the show. "Let's play at something else," cries one, who don't like to play theatre, anyway. The audience disbands in disorder. But the ill-starred stage manager gathers his tiny scene and the puppets tenderly to their box, not omitting the recalcitrant one, and as he listens to the steady roar of the rain on the roof, childish imagination, like the fire of the East, lights up the apotheosis of his little theatre. He stands before a curtain that towers above him as he towers above his paper scene, and the roar of the rain on the roof swells and swells in volume till it deafens his ears. It is not rah--it is applause! Later there were more ambitious experiments on a larger stage, built especial­ly for this production, as the posters of to-day put it, and with an increased list of supernumeraries. These were drawing-room productions at which the family assisted, and to which friends were invited. The show made such a hit that the ever-inventive dramatist sprang a new idea. He stripped the walls of the house of every landscape his father prized and showed them in shifts like a panorama. The quality of the entertain­ment, and not his paternal weakness, saved the son from what this self-respecting father owed his offspring, even if he did seem to be a genius. The Hon. Francis Gillette, Abolitionist, Congressman, and candidate for Gover­nor of his state, undoubtedly was pleased at the enterprise evidenced in his son's boyhood efforts. But his was too well seasoned a mind to entertain much illusion about the lad. Even when William built a dummy engine that ran around the yard—yes, it really did run, those most of us made would not—the deliberate father preserved his paternal poise. You can­not learn much of his father's distinguished posi­tion or of his relationship with Henry Ward Beecher and Charles Dudley Warner from William Gillette. This information is due to Richard Burton, the literary critic, who was one of Gillette's audience in the days of the garret theatre. It is interesting to know these things, however, since they indicate influences the future- actor and playwright might have commanded in order to facilitate his way to the footlights. Gillette probably felt that influence might get him a job, but it could hardly hold it. Besides, when he had graduated from the public school and from the high school at Hartford, his family wished to send him to Yale. But Gillette looked on his future different­ly. "I had got the fever to go away from home and swim out," he said, in al­luding to this period. "I sup­pose everybody gets it some time. Of course, I thought I should go on the stage, although I did not see my way clear just then. My father let me have my way. He liked oratory very much, and spoke well when he needed to, though he was rather a silent man. "I went to St. Louis—just as far as my money would take me—and I got my first job because I told the man I didn't want any salary, only the job." That's the way Mark Twain secured his first job as a compositor. It seems to be a good way —if you don't hold the job too long. Gillette had this view, and he did his best meanwhile to work his way behind the scenes. There was no opportunity in St. Louis, he soon found, and he drifted away till he reached New Orleans. After he had persistently annoyed the manager of the stock company at the St. Charles Theatre he was allowed to play utility parts and supes. The manager saw no other way out of it except by resigning. "My greatest disadvantage in those days was my height. I was so tall beside the av­erage actor they couldn't place me. I got frightfully discouraged after a while and I wrote a vaudeville sketch for myself in the belief that I would have to quit the legiti­mate. The very first part I played was an Indian. It was in a play Oliver Doud Byron brought to the St. Charles. Two years later in Cincinnati, when I was in Macauley's Stock Company, he came there in the same play. Some other infernally tall man had ­the Indian then. I chaffed Byron about his playing the same old part while I had made some progress in two years. "But directly after I left New Orleans I came to New York and got 'foreman of the jury,' in John T. Raymond's run of 'Col. Sellers,' at the Park Theatre. The part consisted of the lines, "We have,' and 'Not ­­guilty.' I said them a whole season and got ten dollars a week for doing it. At the same time I was taking a scientific course at the University of New York." The next season Gillette did much better. He got the "District Attorney" in the Union Square run of "Col. Sellers." The part gave him opportunities of which he profited. People began to know he was on the stage. After that he went to the Globe Theatre in Boston, where he played numerous small roles and character 'bits.' He spent his spare time in taking a special course at the Institute of Technology. His next jump was to Macauley's Stock Company at Cincinnati, and here after two years of drudgery he got that chance for which every actor and actress not yet arrived hopes and prays for with every breath drawn. It is to have a full house, a fat part, and to grip both. Every eye in the audience rivets on your every expression, move and gesture. Every ear is strained to catch your lines. Every line you say takes, and when the scene comes—the great scene that is yours—you hold them in your power fascinated. Then you free them to clap, to stamp, to shout, to whistle mani­acally, which is their gratitude for the anguish you have laid on their hearts. Gillette's moment came entirely by accident. "Macauley himself played the part," he said, referring to that night, "but he fell ill and it was given to me. The play was from the French, and I believe was called ‘The Mother's Secret.' The piece was being done at the same time at the Union Square in New York. The part was a good one and just in my line. The people seemed to like the way I did it, and from the after-de­velopments, it looked as though I had made my first real hit. "Somehow, it did not interest me as much as I had expected. You see I had been work­ing all that season on my first play, 'The Professor,' and it was finished just about the same time. I did not try to do anything for the next two years except to get 'The Professor' put on. And I had plenty to do, I assure you. Finally 'The Professor' was produced at the Madison Square Theatre June 1, 1882. It ran for six months." That date sticks in Gillette's brain. It came after ten years of the toughest uphill work and of alternate hope and gloom to mark a new era in his career. Henceforward he was actor and playwright, for his own performance in "The Professor" was half the comedy's success. 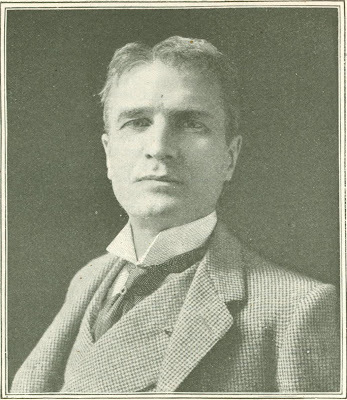 Since then be has produced the following plays, original and adapted: "Esmeralda," "The Private Secretary," "Held by the Enemy," "A Legal Wreck," "Ninety Days," "Mr.Wilkinson's Widows," "Settled Out of Court," "All the Comforts of Home," "Too Much Johnson," "Secret Service," "Because She Loved Him So," and "Sherlock Holmes." It may be added that during his career Gillette has played upwards of a thousand parts. In "Held by the Enemy," he played the War 'Correspondent' which was not the most important character in the piece. In "Esmeralda," "Settled Out of Court" and "Because She Loved Him So" he did not ap­pear. In the remaining plays he was the main character. A survey of these plays would convince the most uncritical that those which are serious are intensely dramatic, and those that are the reverse are crammed with irre­sistible fun. First of all they are stage plays. Everything in them, lines or busi­ness, is meant to be acted, not to be read. Yet it is no dull work to read such a play as "Secret Service." If one likes to read plays, the lines of "Secret Service," cou­pled with the exquisitely accurate directions for every scene, every step taken by the characters, make reading as exciting as the most dramatic episodes in a novel of Dumas pere. But the play was not written to be read. Each line is put down with a view to oral delivery. Now a novelist sets down his dialogue rather as recorded speeches. Here lies the void between the novelist and the dramatist. Hence also may be gleaned one reason why dramatized novels are generally so disappointing. Of course, there are many more. In the case of "Sherlock Holmes,"
Gillette devised a wholly original intrigue to fit the detective made famous by A. Co­nan Doyle. This main character Gillette sur­rounded with the people necessary to carry the drama. Into their mouths he put act­ing dialogue. Then marking the passages he believed to require the particular attention of the creator of Sherlock Holmes, he sub­mitted his play to Dr. Doyle. The latter sug­gested some minor details of local color and found nothing more to do on the piece. The ten lean years of planning and sweating and plodding which resulted in "The Professor" were followed by ten years of plenty. Then fell a catastrophe in "Ninety Days." This was such an ordeal as the man of success fears more than he ever dreaded the non-fulfillment of his hopes in the days of his long suffering. In 1893—a bad year for many people—"Ninety Days" was pro­duced. The play was a failure. Gillette sank a fortune in this wreck; what was worse, his health had just given out, and he had suffered an irreparable family bereavement. Yet one man has never lost faith in "Ninety Days." He is Charles Frohman. More than once he has asked Gillette to fix the piece for a new production, but the play­wright has no heart in it. A man may build on the ruin of his hopes, but sometimes more than mere ambition goes down in the crash. On account of his shattered health Gillette went to Paris for treatment by Dr. Charcot. The famous and shrewd nerve specialist sent his patient to a sanitarium in the south of France in which the doctor himself held a controlling interest. The patient built up his strength notwithstanding and returned to the stage a couple of years later as the imperturbable and delightful liar Billings in "Too Much Johnson." This farce is an adaptation from the French, which some people believe is an­other term for translation. To instance the difference between the two, you must know that there is no such character as Billings in the original "Plantation Tomassin." In the adaptation Billings is the whole farce. It can easily be inferred from this how much creative effort Gillette must have put in "The Private Secretary," "Mr. Wilkinson's Widows," "All the Comforts of Home," and "Settled Out of Court." "Esmeralda" was taken from the story by Frances Hodgson Burnett. 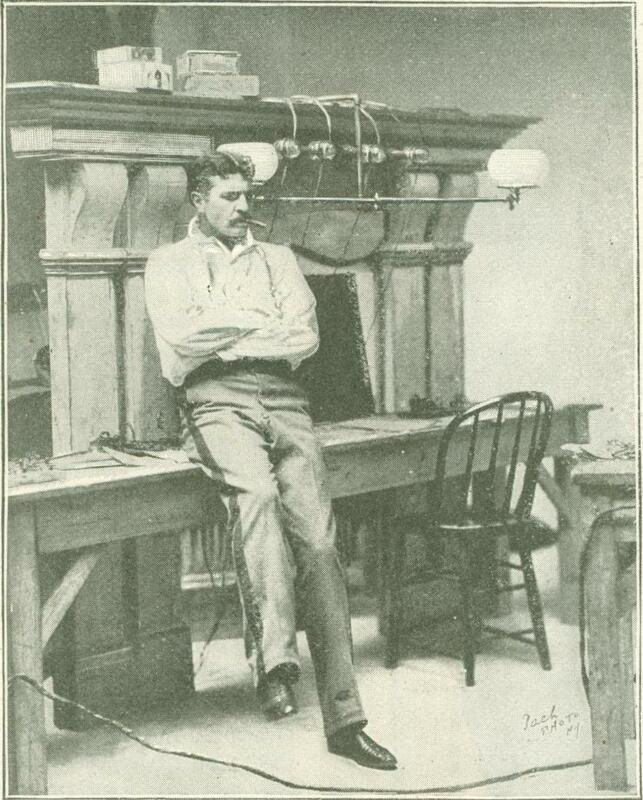 On October 5, 1896, Gillette electrified a first night audience with "Secret Service." He leaped in a bound to his former glory. The memory of "Ninety Days" was blotted out from all minds save his own. "Secret Service" kept a crowded house for nine months and was then transferred to London with equal triumph. Two or three road com­panies have been playing it since throughout the United States. Its next assignment will be to the stock companies, which frequently produce this author's old plays. Three years after "Secret Service" came "Sherlock Holmes," whom we have still with us. The play founded on A. Conan Doyle's fascinating detective has struck deeper roots for the fame of Gillette. Some people have dismissed "Sherlock Holmes" as noisy melodrama. There is the best kind of melodrama in it; but also there is a fund of feeling, and a keen regard on the reality of things which hits home. That's why peo­ple have filled the Garrick Theatre for the past nine months. And as for the melo­drama that is in it, that's what the world loves and has always loved. Would you edu­cate it to higher tastes? First try to extir­pate the human passion for pie. 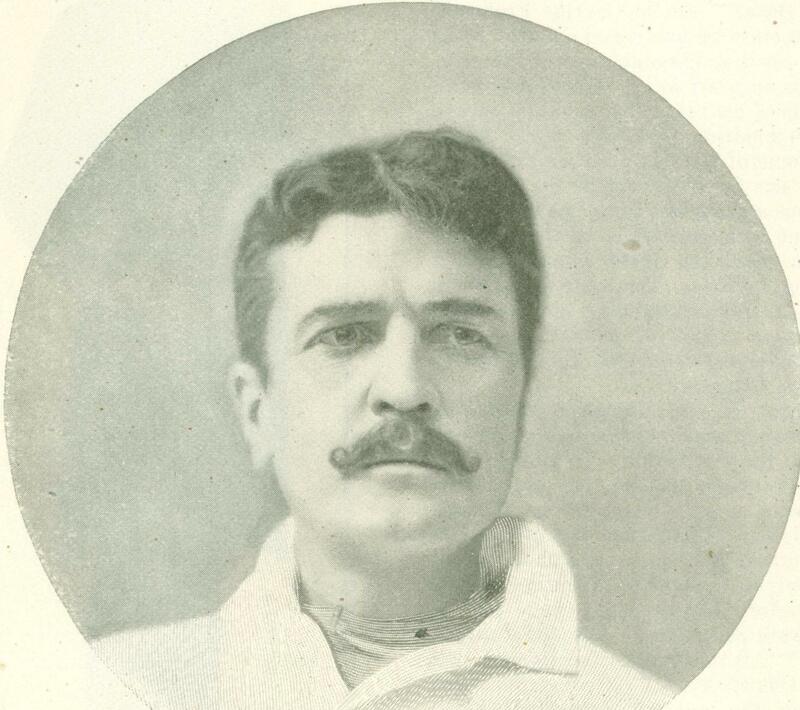 But fame is not the burden that Gillette bears; it is borne by the thousands who see him act or see his plays acted. Work is all he recognizes. His share is to do his work well. As his health is frail, his work is some­times heavy, so heavy that not the greatest glory for his manner of doing it can compensate. Yet his sense of humor is exquisite, and he can pick the funny side of the worst unfailingly. He seems capable of seeing the joke in a toothache of his own. Perhaps his humor is sharp because he sees things as they are. When you do, many things are laughable. Yes, you can put him down as a realist, though always a master craftsman of the stage. This has been his tendency professionally not less than personally, in spite of the fact that in his early days the giants of the classic drama were dominant. "Of course, we were all enthusiastic over Booth and the others," he said on this point. "I was, too, but I knew my line, and that I had to stick to it. Charles R. Thorne was the man who most influenced me. You don't remember him, I suppose. He was full of ­force and yet very natural. He was great in the old Union Square days in such parts as Daniel Rochat. Of course he's forgotten by most people now - everybody is sooner or later no matter what he does or how he does it." Then arose the unimportant but ever-re­current question and wonder of the theatre­goer, whether a man gets tired playing the same part night after night. "This man does," said Gillette. "I have met those who do not seem to mind it. I played the 'Private Secretary' nearly 1,500 times, and was close to insanity—if not quite there." "Of course you didn't have any notion that it was to be a matter of 1,500 perform­ances on the first night?" "I may be sanguine sometimes, but I don't think I'm presumptuous. A man likes to feel that his play will last. With some plays had it is difficult to predict with certainty, though an expert can usually tell what the probability is. Of a vast number, of submitted plays a man of experience and judgment can be certain they are worthless. With a few he can be reasonably certain they stand a fair chance of success. With none can he be absolutely certain." Gillette has had luck, as was premised, but he has had both kinds, as is known. What has weighed heaviest in his career, however, is the irresistible energy that can be read in every line of his strong, pallid face, and in the build and poise of his massive head. Harness this force with almost flawless constructiveness and you have the boy who can build an engine to run around his yard, the young actor who takes a col­lege course while filling an engagement, and the playwright who can build a play to run indefinitely. Off the stage Gillette is distinct from many famous actors in that he has no pose. He does not play at being handsome, or as a social quantity, or as a literary dilettante. He seems rather to be such a man as might sit at the helm of a great business enter­prise, and sit with success. After his night performances he frequently spends an hour or two walking in Central Park. Walking is his favorite recreation during the season, because he finds in it the greatest relief from the nervous strain of his work. All the summer he passes in a Castle of Indolence which is his houseboat. House boating is a pastime of which he is one of the pioneers in this country, and which he advocates un­reservedly. He has admitted, however, that this thing is too slow for most of the people he likes, and who, he believes, like him. He once invited a party for a cruise up the Hudson on his houseboat, but most of the members begged to be let off before they were beyond the limits of Manhattan. They couldn't stand it to see tugs, scows and all kinds of nondescript craft running away from the houseboat. Yet you might know Gillette for an actor from the flexible carriage of his very tall, meager frame. He generally walks up and down nervously while in conversation, and has the finished actor's second nature of giving exquisite value to his words. The dry humor which is so natural to him has a sharper smack because of his perfect utter­ance. Again he differs from many of his profession in that he has no strain of im­providence. He is systematic in all details down to the precise half-print letters of his signature. Of course he must be in receipt of a large revenue since he enjoys that of both the star and the dramatist. But it would be an error to think that the purple and fine linen of success have changed the attitude to­wards life a man so rational must long ago have learned. He has achieved the endless hard climb of the Mountain of Struggle, he has gained the trophy of the victor; but the delight and appetizing doubt of effort are lost to him, the mystery he sought to pene­trate is laid clear. High as our ambition may aim, relentlessly as we may strive, per­haps the rarest happiness lies in that we should never quite get there. From Ainslee’s Magazine, August 1900.